While listening to Dr. Van Tharp’s “Developing A Winning Trading System That Fits You” course audios, Chuck LeBeau talks about how some of his research has shown some promise around ADX (Stands for Average Directional Index. You can find more information about ADX here) . 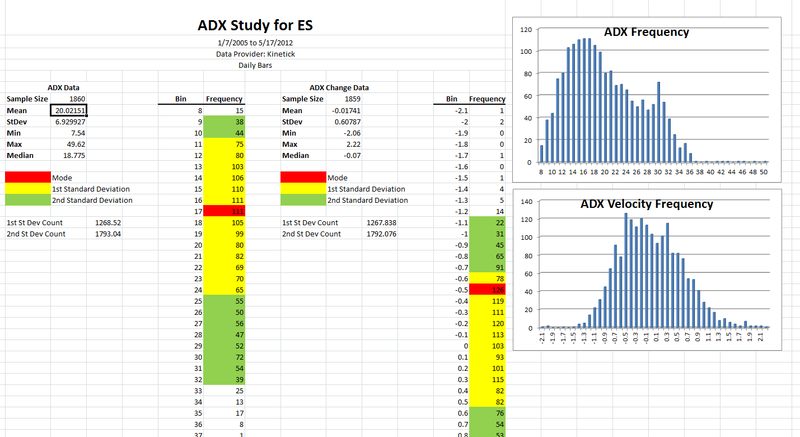 He said that his research didn’t turn up anything too interesting about the actual ADX values, but the change in those ADX values yielded some interesting results to utilize. I know Chuck is a trend follower that will hold trades several days to months long (until his exit criteria is met), but as I am more focused on shorter-term day trading, I thought I would look to see if the same advantage exists for shorter term traders with the S&P E-mini future. ADX is an indicator that measures how strong a current trend is (regardless of direction) by averaging previous directional values. I won’t get into the specifics, but a large change in ADX would indicate a large increase in directional movement. The hypothesis behind this is that if the market moves strongly in one direction to accelerate the ADX value, then that move should continue. Thus I decided to look at the ADX values with a period value of 20 for the daily bars, 6765 tick bars, and 987 tick bars. Data was provided by Kinetick. 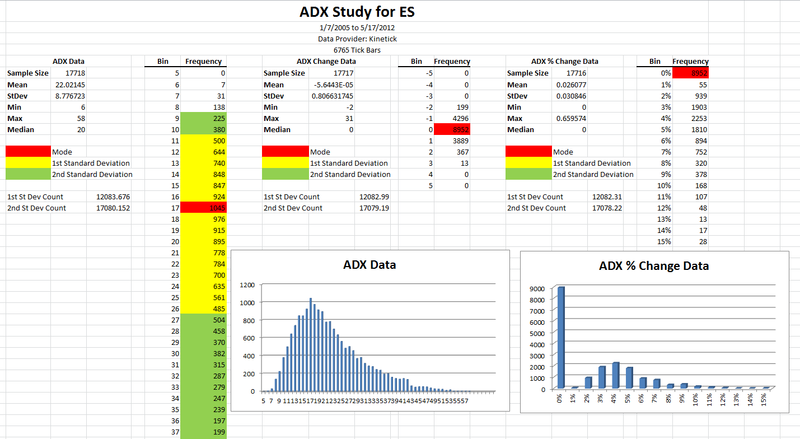 The data I looked was: the ADX value, the change in ADX from the previous bar’s ADX value, and the % of change based on the ADX value (ADX value of this bar – ADX value of previous bar / ADX value of this bar). I first pulled this data into a database and then plotted it in Excel to look at the data profile. From here, I will back test an entry strategy to see if it yields decent results worth pursuing. First up was the 987 tick bars; my favorite sized bars for entry for day trading. These are very short term bars; similar to 1 minute bars. But I like the detail they provide for entries so I thought I would take a look and see what the ADX values were. As the chart shows, the ADX value frequency is concentrated around 12 to 16, with the 1st standard deviation being 10-23. The ADX change showed that there really isn’t too much change happening between bars with values of -1 to 1 holding the majority of values. I quickly started to see that my period selection of 20, while usually being the default value, may have been too large to get a good indication of ADX acceleration/deceleration. The 6765 tick chart, my mid-term chart, yielded similar results. The ADX VPOC (Value Point of Control) value was 17 while the 1st standard deviation was 11-26. The profile is very similar to the 987 chart. I also took a look at the % change of ADX acceleration/deceleration, to see if there was any interesting there. There definitely were some larger % changes, but I would have to run a backtest on those values to see if they yield significant results over a basic numerical value increase/decrease. Finally, the daily bars were also similar. The ADX VPOC was 17 with 1 standard deviation range of 11-24. 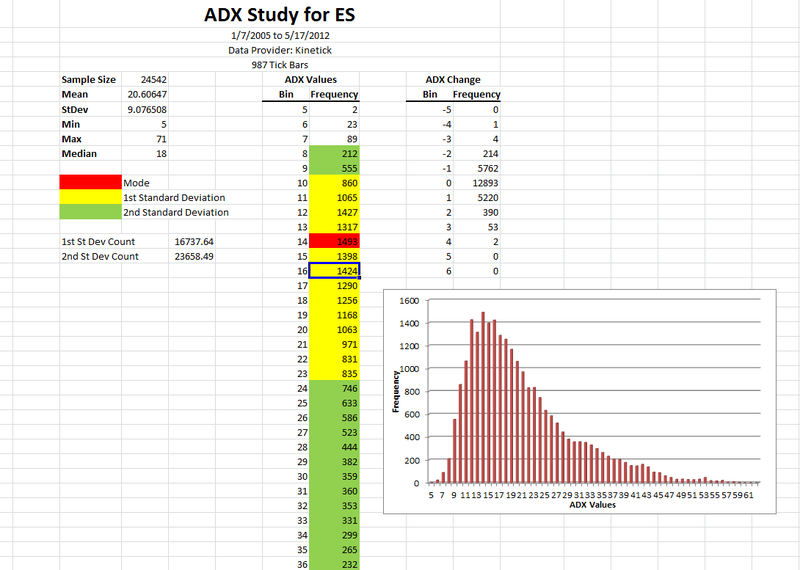 I got a more precise on the ADX change data and saw the 1st standard deviation range was -0.6 to 0.5. Looking at the data, I could develop a backtesting strategy to see if the results are significant for finding an entry setup, but given that I used a period size of 20, I think it might be better to use a smaller period value first. Basically, a strong move could be drowned out by smaller, but opposite directional moves during the period. Thus I will look to change this and see if that first before proceeding ahead.